Mr. Howard: Allow me to acknowledge in your paper, the receipt of a box of supplies for the Hyde Park boys in the Brigade, from their friends in Hyde Park. The articles sent are of excellent quality, and what will do most service of anything that could have been sent. Also, allow me to say that from what I have seen of the Hyde Park boys, in the service, and I think I have seen as much of them as anyone, those who have so generously remembered them may be assured that their kindness was not bestowed on unworthy objects. Hyde Park boys have given a good account of themselves so far. I regret to state that Corporal Franklin Staples, of my company, died last night of diphtheria. He was a noble-hearted, good soldier, and an excellent officer. His loss will be very keenly felt by both officers and men of his company. Our company has suffered severely. Four have died since we came to this camp. Julian Scott, Franklin Bailey and John N. Patch, all of Wolcott, have died of typhoid fever. We had from 30 to 40 on the sick list for a month. Of these, I should think there were as many as 20 cases of typhoid fever and as many more with measles. Disease has thinned our ranks more than a hard battle would have done. This regiment has lost 27, which is more than double the loss of the 3d Reg., and considerably more than that of the 2d, including Bull Run and all their other losses. Six of our company; Burns, of Troy; Butler, of Morristown; Davis and LeBarron of Cambridge; Garvin, of Johnson, and Dike of Morristown are at the General Hospital, at Washington, and were doing well when last heard from, though we do not hear often. Of the others, no one is dangerously sick except Luce, who has the typhoid fever. For the last fortnight we have been gaining fast, and unless diphtheria makes an inroad, the prospect is very favorable. Although the deaths have been numerous, they have been few compared with the number of cases of sickness. I have been this minute in giving the sanitary condition of the company, because I know there are many friends anxious to hear from us. The men are feeling very well, and happy, and generally contented. I am certainly surprised at the ardor at which they turn out when there is any prospect of fight. I had supposed that when they came into close proximity, the courage of many would fail; but nothing will bring out so many men, and so quickly, as to tell them there is show for a fight. This is not boyish inconsiderateness, either. Though we have not exchanged shots with the enemy, we have been in many places of danger. It is a severe trial of a man’s nerve, to be put on the outposts on a line of sentries, within woods and thickets within easy gunshot, and hear them firing, first on one side, and then the other; but our men have been there, and do not flinch. I have passed along the lines at all hours of night, and have heard alarms and firing; but never have seen a Lamoille County man flinch. In fact, not a single Vermont soldier, has ever retreated from his post, or given a single false alarm; though I must say I have seen some look as though they would be glad to do so. I cannot give you any news. That is chiefly manufactured in Washington, and you get it in the papers. Our first half of December has been the finest autumnal weather I ever saw. The thermometer has repeatedly been at 65 in the shade, and this half month has been as warm and pleasant as I ever saw the last of October in Vermont. The enemy has shown signs of being very reckless within the last week. They have moved out of their line of pickets very near ours and they have been continually prowling around our lines, trying to either get information or pick off our guards. No one of our Brigade has been killed or wounded by them, although one occupying the same ground we do, was wounded Thursday night. The rebels are evidently very uncomfortable, and very anxious to have us do what so many brave generals who stay at home and write news articles, are clamoring for us to do, attack them in their strongholds. If we remain as we are, I do not think it possible for them to keep their army together through the winter. It is the opinion of good military men that they will be freed to come out of their holes and give up fight, in order to keep their army together through the winter. If they do so it will because they are desperate. If they do this the war will be very short. Our men are comfortable and since they have got stoves in their tents, do not suffer at all from the season, and will not except on guard duty. We have been very generously supplied with all kinds of necessaries and not a few luxuries. Our men live better then they would average at home, and are much better clothed, notwithstanding reports to the contrary that have gone home. I think they like the service. Sickness and death have made things at times, look hard, but they are passing by. Reuben Clark Benton. Since his settlement in Minneapolis, in 1875, Col. Benton has been one of the most prominent figures at the bar. The solidity of his character, his attainments as a lawyer, and not least, his genial temper and courteous manner, have made him a leader of the bar. A practice of twenty years in his native state had already given him ripe experience and thorough acquaintance with all the varied features of his profession; while a boyhood passed upon a ragged farm had infused into a robust frame, the vigor which comes from an active life, and a few years of active and not inglorious military service, in early manhood, had steadied and matured his character. same name given to this, his eldest son. He had settled in Waterford, Caledonia County, Vermont, in early life, where he owned a farm. He was prominent in public affairs, holding many local offices as well as representing his town in the State Legislature, and in later life drifted into the practice of law. His mother was Almira Fletcher, allied with the prominent families of that name in Vermont, and connected with the Fletchers of Minneapolis. R. C. Benton was born in Waterford, May 13, 1830, but removed with his father's family to Essex County, in the same state, when he was eleven years old. He had an early desire to receive a collegiate education, which was not seconded by his father, and he remained upon the paternal farm until his majority, in the meantime seeking a preparation for college as best he could, and devoting some time to reading law with an uncle, Jacob Benton, of Lancaster, N. H., and also with William Heywood, of Guildhall, Vt. Within ten days after reaching his majority, he entered the University of Vermont, at Burlington, in the third term of the freshman year, where he completed the college course and graduated in 1854. Like most farmers' boys of the period, he had a debt for his education, which must be discharged before entering upon a profession, and he spent the following two years in teaching a grammar school in Lamoille County, Vt. He was admitted to the bar in 1855 and commenced practice the following year at Johnson, Lamoille County, Vt. After two years he removed to Hyde Park, in the same county, forming a partnership with John A. Child, of that place. The growing law business of the young lawyers was interrupted by the clarion of war, which, resounding among the mountains, summoned the sons of the Green Mountain Boy's of the Revolution, as it had their ancestors, to leave the plow in the furrow and the brief unread, and hasten to the defense of their country's flag. 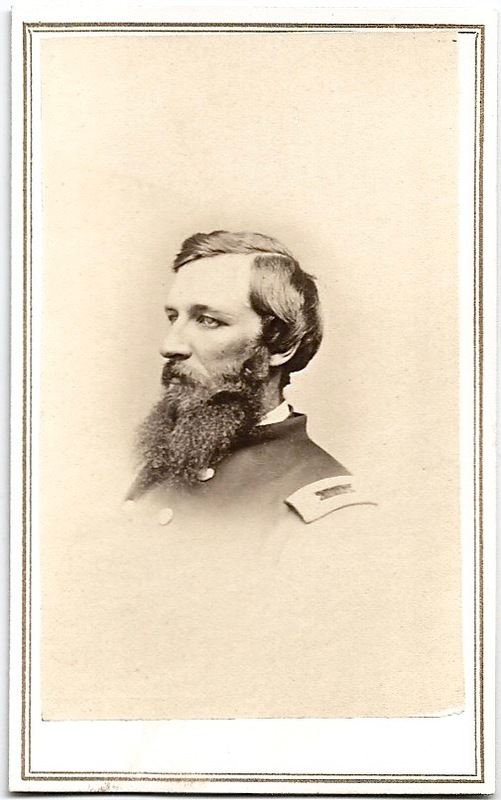 Mr. Benton joined a company of volunteers, of which he was commissioned captain in the Fifth Regiment of Vermont Infantry, and then marched to the front. This regiment was actively engaged during the whole of the first peninsular campaign. At the battle of Savage Station, he received a buckshot wound in the arm. A year later he was promoted to the lieutenant-colonelcy of the Eleventh Vermont Infantry, which afterward became the First Vermont Artillery. After his promotion his command was stationed on the Defenses of Washington. On the 13th of May, 1864, the regiment was ordered to the front, serving as three battalions of infantry, and joining Grant's army at Fredericksburg. It shared the dangers and glories of the flanking campaign carried on in the approach to Richmond. At the sharp action of Cold Harbor, Col. Benton was actively engaged, and during the exposures which followed that action, contracted a malarial fever, which obliged him to resign his command. Returning to Vermont, he found his partner had died, his law business had been broken up, and the expenses of a family left behind had dissipated his slender accumulations. While he was endeavoring to gather up the scattered threads of his affairs, he was summoned by the governor of his state to aid in repelling the raid organized by rebel refugees in Canada on St. Albans. After two months in this service, he again returned to his law. In 1867 he removed to St. Albans and became associated with W. I). Wilson, and afterward with A. P. Cross. There he was busily employed for seven years, and until his removal to the West. The practice extended into Franklin, Orleans and Lamoille Counties. It was of a general character, such as the country districts of New England furnished at that day -- fuller of labor than profit, but giving a wide experience at nisi prius as well as in bank. Mr. Benton had married in 1856, about the time of entering his professional life, Miss Sara Maria Leland, of Johnson, Vermont. Of four children born of the union, two had died in infancy and the health of two growing daughters was injuriously affected by the severe climate of that mountainous region. In the hope of benefiting the health of his family, he determined to move to a more inland region and came to Minneapolis in 1875. The hope seemed to be realized for a time. The eldest daughter married Mr. R. M. Douglas, an accomplished young engineer, but in the winter and spring of 1882, both daughters succumbed to the malarial influences which so fatally prevailed at that period. Col. Benton, on coming to Minneapolis, formed a law partnership with his younger brother, C. H. Benton, which continued until 1881.
the merging of that company in the Great Northern Railway Corporation, his employment was continued, and still exists. The labors of the position are varied and onerous and have withdrawn him in a great measure from general practice. During the whole of this time, the crossings controversy7 has been in progress, and has occupied the attention of the District and Supreme Courts of the state, and has been taken by appeal to the United States Supreme Court. Early in the controversy the Manitoba Company, under the judicious advice of their local attorney, came to a substantial agreement with the authorities of the city; but the interests and obstructions of other companies prevented a settlement until recently. The whole matter, so far as the West side is concerned, is now satisfactorily arranged, and the improvements so long delayed are in progress. The question as to the East Side crossings is still open, but negotiations for an adjustment are in satisfactory progress. argue before the Court the nice application of legal principles, and almost always faces a jury sympathizing with his opponent. Col. Benton, by his candor, dignity, and learning, has been able to retain the confidence of the Bench, while his diplomatic skill has not seldom won verdicts from reluctant juries. But it is not alone as a lawyer that he has been distinguished. Colonel Benton has always, since he became identified with Minneapolis, been one of her most public-spirited citizens. He has served upon the Board of Trade and in various representative and consultative capacities. He is a pleasant and persuasive public speaker and is ever ready to aid all movements for the good of the community, 01 in aid of the unfortunate. He has a pleasant home at No. 1815 Hawthorn Avenue, where are enjoyed the quiet but refined associations of domestic and social life. Benton, Reuben Clark, of Minneapolis, Minn., son of Reuben C. and Almira (Fletcher) Benton, was born in Waterford, May 13, 1830. In 1841 he removed with his father's family to Lunenburg, where he resided until twenty-one years of age. During that time by study at home and at such schools as were in Lunenburg, and two terms at the St. Johnsbury Academy, he was fitted for college. He entered the University of Vermont in May, 1851, and was graduated in 1854. After graduation he went to Johnson, where he took charge of the academy. Previous to entering college he had read law with the late Jacob Benton of Lancaster, and with William Heywood, then of Guildhall. While in Johnson he read law with Whitman G. Ferrin now of Montpelier and was admitted to practice in June 1855. He commenced practice in 1856, remaining in Johnson until 1858, then removing to Hyde Park, where he continued until 1867. March 18, 1856, he was married to Sara M. Leland. They have had four children, all of whom are deceased. At the breaking out of the war of the rebellion he entered the service as captain of Co. D, 5th Regt. Vt. Vols., at the organization of that regiment in September 1861, was present with his regiment until July 1862 and was wounded at Savage Station in June of the same year. Upon the organization of the 11th Regt. in August 1862, he was made lieutenant-colonel of that regiment, in which position he continued until the last of June 1864, when he resigned for disability. In March 1867, he removed to Saint Albans, where he continued in the practice of his profession until June 1875, when he removed to Minneapolis, Minn., where he still resides. He was in the years 1879, 1880 and 1881 elected city attorney of the city of Minneapolis, which office he resigned December 1881, to enter the employ of the St. Paul, Minneapolis & Manitoba Railway Co., as its attorney at Minneapolis. For its successor, the Great Northern Railway Co., Mr. Benton and his firm still continue as attorneys, having, besides, a general practice. During his practice in Minneapolis, he was at first in partnership with his brother, C. H. Benton, also a Vermonter, under the firm name of Benton & Benton; after the dissolution of that firm, with William P. Roberts, as Benton & Roberts; and for the past two years with Mr. Roberts and Rome G. Brown, the latter a Vermonter, as Benton, Roberts & Brown, which is the present style of his firm. Mr. Benton has devoted himself almost exclusively to the practice of law since his residence in Minneapolis and has won the position of one of the leaders of the bar of Hennepin County, and of the state. In politics, he is a Republican but has no religious affiliations. Source: Jacob G. Ullery, compiler, Men of Vermont: An Illustrated Biographical History of Vermonters and Sons of Vermont, (Transcript Publishing Company, Brattleboro, VT, 1894), Part III, pp. 16-18. Col. Reuben C. Benton died at his home, 1815 Hawthorn Avenue, Tues. Jan. 8, at 1:40 o'clock. Mr. Benton suffered a stroke of paralysis Dec. 30, since which time he has been gradually sinking until death came. R. C. Benton was born in Waterford, May 13, 1830, but removed with his father's family to Essex County in the same state when he was 11 years old. He had an early desire to receive a collegiate education, which was not seconded by his father, and he remained upon the paternal farm until his majority, in the meantime seeking a preparation for college as best he could, and devoting some time reading law with his uncle, Jacob Benton of Lancaster, N.H., and also with William Heywood, of Guildhall. Vt. Within ten days of reaching his majority, he entered The University of Vermont at Burlington, in the third term of the freshman year, where he completed the college course, and graduated in 1854. Like most farmer's boy's of that period he had a debt for his education which must be discharged before entering upon the profession, and he spent the following two years in teaching a grammar school in Lamoille County, Vermont. He was admitted to the bar in 1855 and commenced practice the following year at Johnson, Lamoille County, Vt. After two years he removed to Hyde Park, in the same county, forming a partnership with John A. Child of that place. 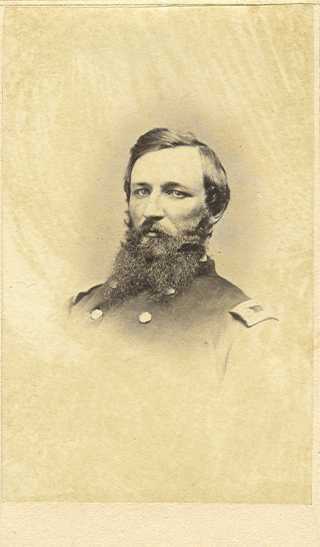 Mr. Benton joined a company of volunteers, of which he was commissioned captain in the 5th Regiment of Vermont Infantry., and marched to the front. The regiment was actively engaged during the first peninsular campaign. At the Battle of Savage Station, he received a buckshot wound in the arm. A year later he was promoted to the lieutenant-colonelcy of the Eleventh Vermont infantry, which afterward became the First Vermont artillery. In 1867 he removed to St. Albans and became associated with W. D. Wilson, and afterward with A. P. Cross. There he was busily employed for seven years, and until he removed to the west. Mr. Benton had married in 1856, about the time of entering his professional life, Miss Sarah Maria Leland, of Johnson, VT. Of four children born of the union, two had died in infancy, and the health of the two grown daughters was injuriously affected by the severe climate of that mountainous region. In the hope of benefitting the health of the family, he determined to remove to a more inland region and came to Minneapolis in 1875. The hope seemed to be realized for a time. The eldest daughter married B. M. Douglas, an accomplished young engineer, but in the winter and spring of 1882 both daughters succumbed to the malarial influences which so fatally prevailed in that period. Mr. Benton on coming to Minneapolis formed a law partnership with his younger brother, C. H. Benton, which continued until 1881. In 1879, Col. Benton was appointed city attorney of Minneapolis, holding the office until December 1881, when he resigned. It was a period of rapid development in the city, and the city attorneyship assumed peculiar importance. Many claims for damages for personal injuries were made against the city, but not a single judgment was obtained. The first controversy with the railroad, respecting the bridging of tracks, arose at this time. It was settled satisfactorily to the interest of the city. Upon his resignation, Col. Benton was appointed local attorney for the St. Paul, Minneapolis & Manitoba Railroad Company, upon an annual salary, with liberty to engage in other practice. Upon the merging of that railroad company with the Great Northern Corporation, his employment was continued. It was not alone as a lawyer that he was distinguished. Col. Benton was since he became identified with Minneapolis, one of her most public-spirited citizens. He served upon the Board of Trade, and in various representative and consultative capacities. He was a pleasant and persuasive public speaker and was ever ready to aid all movements for the good of the community, or in aid of the unfortunate.